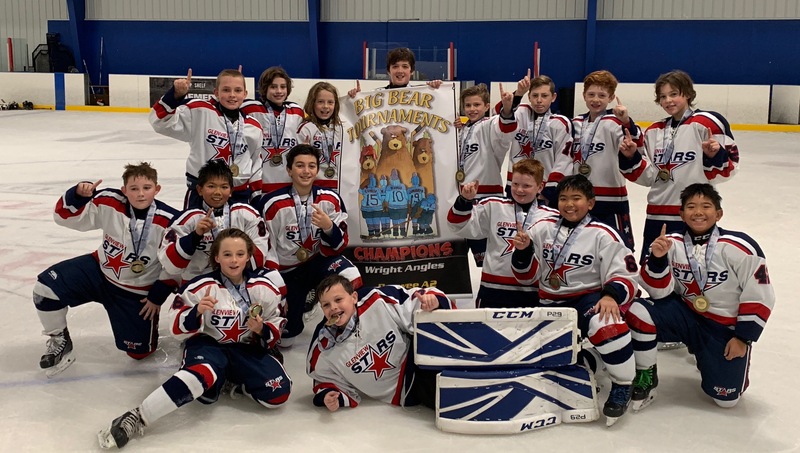 The Glenview Stars PeeWee 2 team played in the Wright Angles tournament in Madison, Wisc. Coaches Alex Merkle and Paul Goodman took the team to a championship victory over the Waterloo Jr Hawks. The Stars ended the tournament with a 3-0-1 record, outscoring opponents 20-11. Great games were had by the entire team consisting of Ryan Ahlgrim, Ace Aiello, Ryan Besenjak, Alex Bottcher, Cam Christopher, Matheson Cooney (MVP), Cole Goodman, Cade Harazin, Blake Hoffer, Morgan Kimmins, Evan McClung, Jonas McClung, Aiden Weller, Leo Zarzuela, Luc Zarzuela and Lorenzo Zarzula. Congratulations Stars!